Richmond Rivets is a Transition Initiative based in Richmond, California. Our focus, like other Transition Initiatives, is to re-localize the essential elements of our community which are needed to sustain and thrive in a world increasingly challenged by dwindling oil supplies (also known as peak oil) and climate change. Our vision is of a vibrant, resilient Richmond, California where progress means interdependence, resourcefulness, and plenty for all. We began meeting in September 2009 to discuss how we could best work together to build local resilience in Richmond. There is much work ahead, but we are excited to take on the challenge and would love to have you join us. Watch this short video by Rob Hopkins. Lila Skye, far left, and other city farmers swapped goods this month in her driveway in Richmond, Calif.
OAKLAND, Calif. — The Bay Area is a culinary never-never land, a place where aspiring apiarists hire beekeeping coaches, and even 7-year-olds can discuss the virtues of Himalayan salt. That is why, on a recent Sunday, a motley group of gardeners bearing windfall harvests of habanero chiles, persimmons and prickly pear cactus fruit gathered for a “crop swap,” an urban agricultural ritual in which city farmers get together to share their surplus bounty. At the weekly event at Pollinate Farm & Garden, an urban farm supply store here, Haven Bourque, 49, a communications consultant, had brought homegrown basil, Japanese eggplant and late-season tomatoes from her garden, which she exchanged for broccoli, bok choy and yellow cherry tomatoes. The crop swap is a sort of farmers market that operates on the barter system. It allows Ms. Bourque to diversify her pantry while socializing with neighbors. “It forces you to be creative,” she said. “As a culinarian, I want that flavor,” she said. Birgitt Evans, a co-owner of Pollinate Farm & Garden in Oakland, Calif., with produce available at a recent “crop swap.” The urban farm supply store hosts swaps weekly. Neighborly exchanges of goods are nothing new, of course: In the early days of the Plymouth Colony, for instance, the Pilgrims traded English tools, clothing and other items for the Indians’ beaver fur and corn, said Patrick Browne, the executive director of the Pilgrim Hall Museum in Plymouth, Mass. But today’s trades reflect food trends coursing through the body politic: At thePDX Food Swap in Portland, Ore., for example, participants share homemade vegan nut spreads; kombucha starters; organic strawberry and cabernet sauvignon jams; brined nasturtium flower buds, considered poor man’s capers; rosemary-infused butter; and homemade rhubarb liqueur. 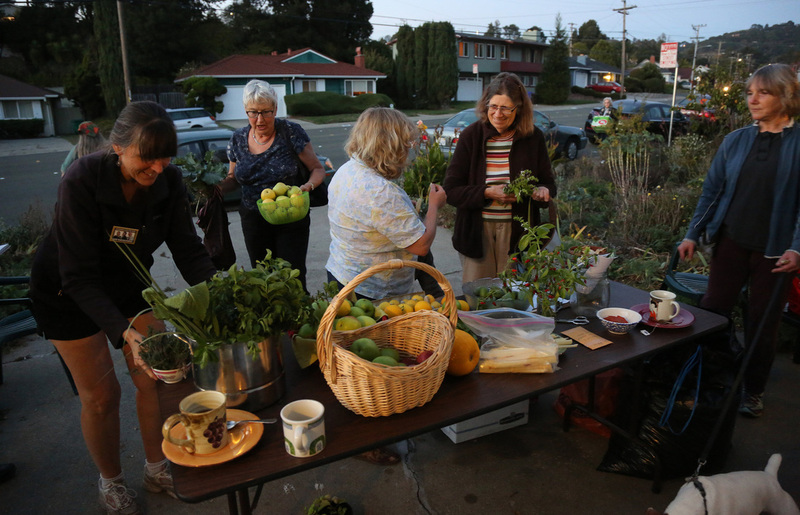 The Bay Area, with dozens of swaps, is arguably the center of crop-swap culture, in which the so-called sharing economy meets urban agriculture. But swaps are found around the country, including the ATXswappers in Austin, Tex. ; the Mile High Swappers in the Denver area; the BK Swappers in Brooklyn, N.Y.; and the Port City Swappers of Wilmington, N.C., whose offerings include hummus made from pickled North Carolina peanuts. The swap concept in California received a lift recently with two pieces of legislation signed by Gov. Jerry Brown: the Neighborhood Food Act, which gives tenants and members of homeowner associations the right to grow food for their own consumption, with certain restrictions, and the Urban Agriculture Incentives Act, which encourages cities to create zones in which landowners can get property tax breaks if they put their land into agricultural production. In 2011, sensing a growing demand for swaps, Emily Han, 36, a writer and recipe developer in Los Angeles, co-founded the online Food Swap Network as a place for people to find an existing swap or set up a new one. It lists about a dozen swaps around Los Angeles. Ms. Han, an avid forager, prepares for the bimonthly swap she started in the city’s Silver Lake neighborhood by hiking through the San Gabriel and San Bernardino Mountains in search of pine needles and fern fronds, which she uses for infusing honey, and roaming city streets to find pink peppercorns, fennel pollen and green walnuts for a liqueur she makes based on an Italian recipe. Ms. Han considers swaps part of the “shareable food movement,” along with canning; community-supported agriculture, in which people place regular orders directly from a local farm; and communal shares in pigs and cows. “For a lot of people, it’s the next step of eating local,” she said. Richmond has designated the purple tree collard, planted originally by Southern shipyard workers, as its official green, and recently incorporated wellness, including agriculture, into its general plan. Visitors to the main library can check out seeds, including heirloom Italian pole beans and kale. Residents are drawn to seeds and swaps in part because growing produce is less expensive than buying it at a supermarket, Ms. Clifford said. At dusk on a recent evening, about five dozen Rivets from around the city assembled in Lila Skye’s driveway for the Ellis M. Gold Memorial Crop Swap, named for her partner and fellow crop-swapper who died of cancer this year. The mood was jubilant, both because of the Vietnamese cilantro, native currants and other crops being shared, and perhaps equally because of the recent election, in which progressive local candidates defeated those backed by the oil giant Chevron, the city’s biggest employer and taxpayer. As night descended, the swappers, smartphone flashlight apps at the ready, perused a cornucopia of fruits, vegetables and herbs that managed to thrive in microclimates, an oddity of Bay Area life in which columns of fog shimmying through the Golden Gate cause wild variations in temperature, wind and moisture, thwarting newbie gardeners. Charles Daniels, an 80-year-old retired lawn and garden shop owner, came with apples, sorrel and pepino dulce, a South American fruit that tastes like a blend of honeydew and cantaloupe. As he delivered them, a large spider was inching up another swapper’s pink-edged camellia.